As makers of power products that reach from the high-value to the high-end, it would be obvious to expect IsoTek to have followed suit with its range of power cords. But, in fact, most of the brand’s power cords have been very much geared toward that value end of the market. 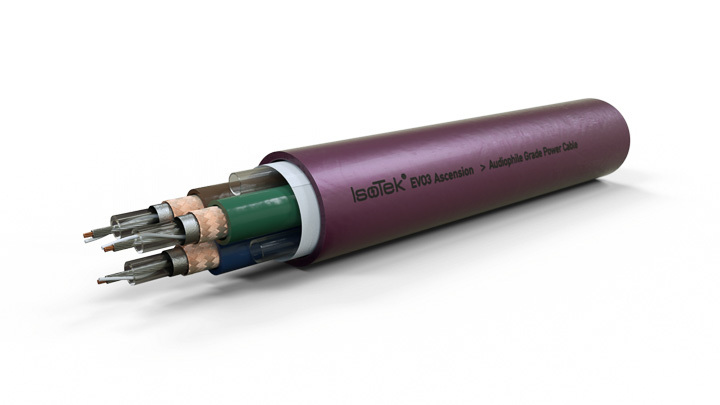 Ascension is the first cable from IsoTek to plant its flag on terra audiophilia extremus, although such is the heady wine from that region, a £2,750 price tag for a 2m cable doesn’t seem thatextreme. I mean, you can’t even exchange it for a small car! IsoTek are playing the purity card with Ascension. It uses a trio of 4mm2high-purity OCC (Ohno Continuous Cast) copper conductors, which are then silver-plated, and encased in a extruded FEP (Fluorinated Ethylene Propylene) with an air dielectric barrier. Each of these assemblies are then matched with FEP/air tubes to act as spacers. This is then wrapped in Mylar, shielded with a similarly high-purity oxygen-free copper braid, and given the deep cryo treatment, down to -196°C. The resultant cable is jacketed in a purple PVC outer and rated at 16A. EVO3 Ascension’s outer diameter of 17.5mm does limit the kind of connectors used, and IsoTek uses high-quality bespoke devices throughout. It means that finding a two-pin figure of eight ‘Telefunken’ plug might be difficult, but you can get the cable terminated for UK, EU, US, and Australian mains sockets. A big part of the design of the Ascension cable is what the company calls an “IsoTek VAD Barrier”. The best permittivity (dielectric constant) would be a vacuum, but that is impractical in a power cord (unless you live on a space station), so IsoTek goes for the next best thing; air, or at least as close as you can get to free air inside a cable. By creating a Virtual Air Dielectric, IsoTek claims a dielectric constant of just 1.0548 (air alone is 1.00059 in the same conditions). This is achieved by minimal conductor contact and using FEP to act as a bridge. My take, however, is the use of solid-core conductors is one of the more important parts of Ascension. OK, so it’s solid-core conductors with all the trimmings (otherwise you get ‘Twin & Earth’ used to hook up your cooker), but solid-core is key to Ascension’s sound. IsoTek’s EVO3 Ascension faces some stiff competition – literally and figuratively. Once you get past a certain price point, money almost doesn’t matter when it comes to power cords, and a £2,750 power cord might well go up against the really big guns costing £10,000 or more. So, it carries the full load of IsoTek on its back. If it fails to reach the heights of high-end audio, those audiophile enthusiasts might look less favourably upon the company’s power conditioners and filters. But similarly, it needs to represent a tangible upgrade on existing IsoTek cables for the faithful who already own a collection of IsoTek products and want the best of the best.